India’s M&A deals dropped nine per cent in value terms to $54.7 billion in 2017, from $59.7 billion in 2016. The number of deals also shrank to 379 from 421. According to Mergermarket data, telecommunications, technology and financial services took the lion's share in terms of deal value, which rose the the case of all three sectors. The overall deal value in telecommunications was up a staggering 28.4x to $20.4 billion from $718 million, with deal count rising from three in 2016 to 11 in 2017. The sector contributed 37.2 per cent to the country's total deal value, up a significant 1.2 per cent over 2016. The top telecom deal during the fourth quarter of calendar 2017 was Reliance Jio Infocomm’s $3.7 bilion acquisition of Reliance Communication's wireless spectrum, towers, fibre and media convergence node assets. This was also the second largest deal in 2017. The Mergermarket report stated that Reliance Jio's entry had fostered competitive pricing in the sector, even as the new entrant began gobbling up the market share of its peers, impacting their profitability. 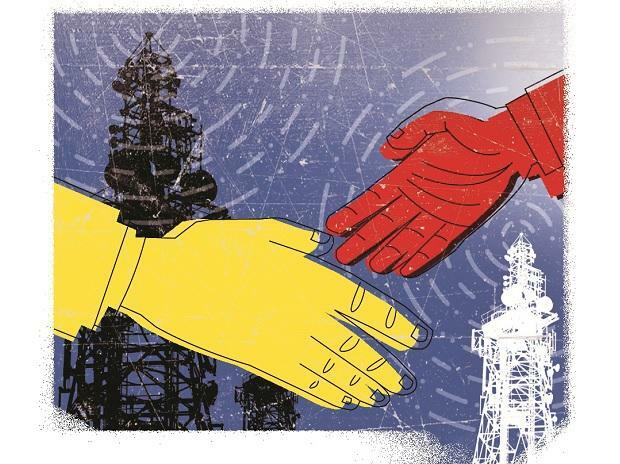 Several potential deal situations have also emerged in the sector -- While Bharti Airtel mulls a merger with another player in the market; RCom intends to sell its tower assets to Brookfield and GTL Infrastructure. Energy, mining and utility saw declines in both deal value (down 69.4 per cent to $5.3 billion) and number of deals (from 44 to 31) between 2016 and 2017. The largest deal in the sector was Adani Transmission’s $1.9 billion acquisition of Reliance Electric Generation and Supply from Reliance Infrastructure. This was also the country's fifth largest deal in 2017. Of the 30 deals in the energy sector, 23 fell under the renewable energy space and fetched a total value of $2 billion in 2017. The total annual deal value in financial services rose 34.3 per cent to $6.9 billion in 2017 from $5.1 billion in 2016, while the count declined slightly to 40 from 45. The largest deal in the sector was the $2.4 billion acquisition of Bharat Financial Inclusion by Induslnd Bank, the country’s fourth top deal in 2017. Consolidation in the sector intensified and more deals are likely to be announced among non-banking companies, especially insurers. Private wquity buyout during the fourth quarter of 2017 dropped 70.7 per cent by value to $2.2 billion (14 deals) from the record high of $7.4 billion (34 deals) in Q4 2016. The private equity exit value was down 64.9% in the fourth quarter of 2017 to $308 million, from $879 million in the corresponding quarter a year ago. Deal volumes declined from 17 to 10. The largest buyout in the quarter was the acquisition of a 5.55 per cent stake in Axis Bank by Bain Capital and The Capital Group Companies. This was also one of the largest private equity investments in the Indian banking sector. More private equity investment in the financial sector is expected in the coming quarters. Outbound value declined for the second straight year from $5.1 billion in 2015 to $4.6 billion in 2016 and $2.9 billion in 2017. All deals in 2017 in the outbound market were below $1 billion, the largest being Motherson Sumi Sytem’s $731 million acquisition of Finland-based PKC Group. This was also the only deal in the market to be valued at over $500 million.